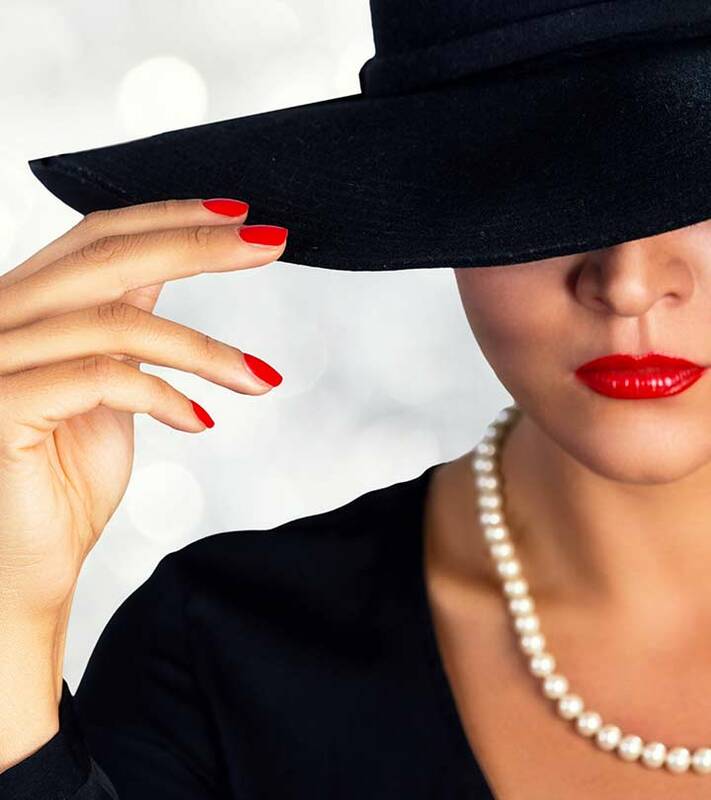 Wearing hats, no matter what type, is the easiest way to make your outfit elegant almost instantly. These are timeless and a discerning choice of accessory for women who like dressing up. 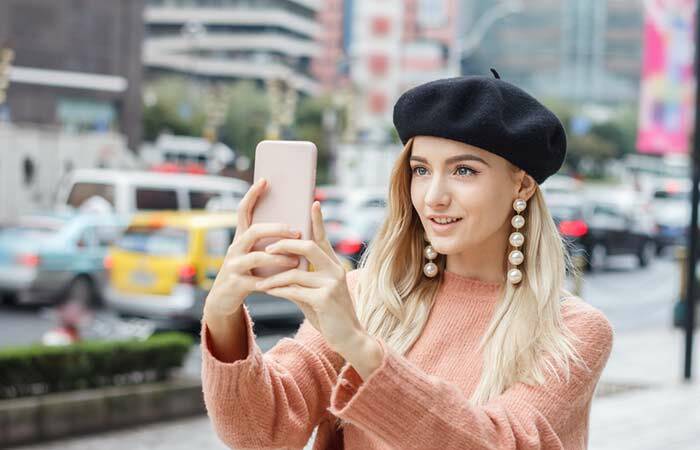 But, if you are new to the hat game, it can be quite overwhelming to look at all the hats out there and figure out what suits your personality and style. While some of them are occasion and event specific, some are traditional – while others are purely an add-on. 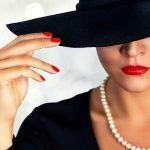 The style of the hats differs from region to region, but there are a few hat styles that are pretty standard across the globe, and evergreen too. 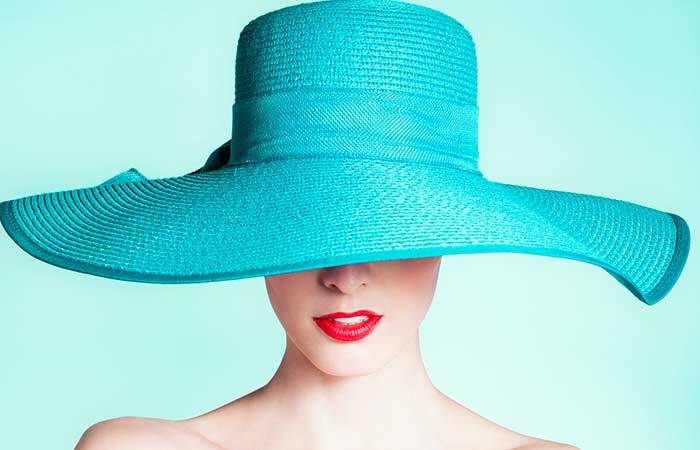 Let’s look at the different types of hats and how to style them. Initially, it was men who wore fedora hats, but that slowly changed, and now it has become increasingly popular among women too. They started making hats that were more feminine, with colors, embellishments, materials, floral arrangements, etc. And, till this date, these hats are the most elegant and popular choice for most women. It has a short brim and an indent either on one side or on both the sides. These are slightly more casual and go with floral dresses, skirts, jeans, one-piece dresses, and jumpsuits. Just wear a layered outfit, throw on a fedora, big brown sunglasses, and camel boots. Ravishing. Another hat variant that was initially worn by men but became popular among women later on. This is one type of hat that all of us use, but may not know that it’s called a ‘Beanie’. It is a long and soft hat made of wool and provides protection and coverage in harsh winters. With time, this hat had its makeover too, and as we all know, it is now available in different colors and models. Beanies look cute with any winter outfit, and sometimes girls wear it otherwise too to make up for a bad hair day, and when they are in a mood to look a little badass. Beret hats originated from France and Spain and were initially used as part of the military uniform before they gained popularity otherwise. These are usually made of wool, acrylic fibers, cotton, etc. They go perfectly with Western dresses and look incredibly stylish. Berets have no rim and are flat hats that just lay flat on your head, with the center of it popping out a little. It can be worn at the center, or on one side if you want to look all European. It goes well with formal one-piece dresses, pencil skirts, and pantsuits. The first thing that comes to your mind when you think about Cowboy hats is a Texan cowboy riding a horse and singing along on a ranch somewhere in Texas or New Mexico. Ranch workers in Southern states first started wearing these hats that had high crowns and big brims. Slowly, women started wearing these as well. 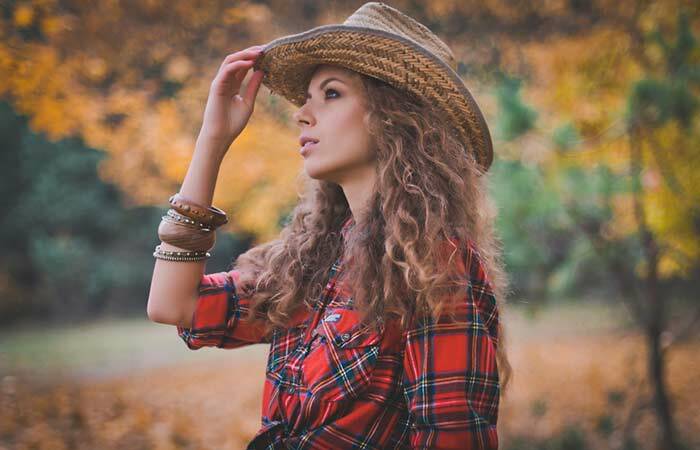 Flannel shirts, jeans, boots, a cowboy hat, and a recycled leather bag – rustic and badass! Baseball caps are the easiest to style and are the most common hats used by both men and women. 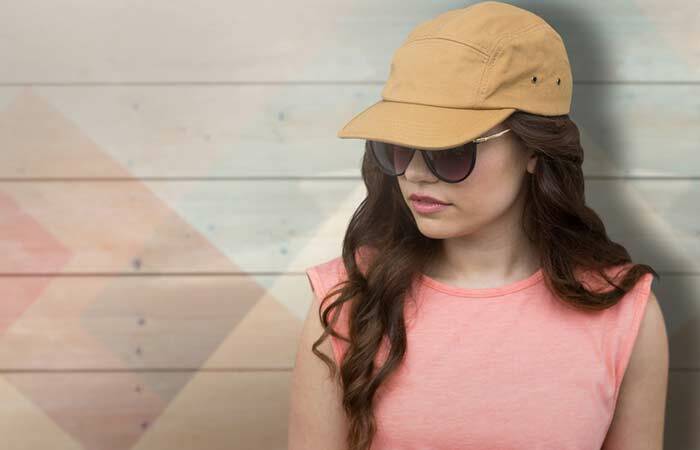 The baseball cap was specially designed to serve a purpose, and the idea for the basic design was to ensure that the cap sits in place, and extends out to give protection from heat and sun while one is playing sports, etc. These are now available in a million variants and are one of the most sought-after headgears. Wear it to feel sporty instantly. Small/mini hats meet in the middle between the fedora and floppy hats. These are a modern addition to the old school definition of caps. These can be used for both formal and informal occasions, depending on the material, make, and how it has been accessorized. Wear it with formal ankle length pants, or skinny jeans and a silk top, and spin it any way you like. Sun hats were initially called the ‘lifeguard hats’, used by lifeguards who sit at the bay to provide them protection from the glaring sun and the scorching heat. These were usually made of straw or some other kind of plant fiber, and were pretty light. Just like all the other hats, these have gotten a makeover too and have changed with the times. Women seldom go on a beach vacation without wearing one of these. Wear it with bikinis, swimsuits, cover-ups, flowing dresses, and anything you want. Floppy hats were a big part of the Bohemian and hippie culture. Women with long hair and cascading curls wore these as an accessory to enhance their look. Just as the name goes, these come with a big and floppy rim that is not so sturdy, but that’s the detailing that makes them look stylish. Wear these with playsuits, floral dresses, jeans or anything casual on a hot summer day, and look effortlessly put together. Derby hats are the most iconic hats and are as English as they can get. They trace back to the 1800s when they were called bowler hats. Initially, these hats were about plain and elegant self-designs. They started to get a makeover as English and world fashion evolved. Women going to Polo matches in England wear these hats with formal dresses, and that’s the most famous look. A formal dress, a pearl neckpiece, pumps, and a small hand tote makes up a look that is as perfect as it can get. Cloche hats were popular in France in the early 19th century. They are long, narrow, and come with a smaller brim. They are meant to sit low on your head. In the second part of the 19th century, cloche hats got a makeover, and designers started to bring in their element with buttons, embellishments, etc. Wear these with a bodycon dress, or with something more formal. Golf caps are one of the most contemporary styles of hats and are impeccably chic. The golf cap was not really for Golf, but it was more like a promotional event wear that caught on, and has now become a big part of the game. But, do not assume that you wear these only if you play the game; women wear it all the time, because – why not? Everything old and retro is making a comeback, one thing at a time. While hats have been timeless, we now see more and more women adding this as an accessory to complete their outfits. Which type of hat is your favorite kind? Do you have any style tips for us? Let us know by dropping in a text in the comments section below.